Learn more about the principals and goals of Collaborative Law practice. What is Collaborative Law and am I a good candidate? Stay up to date with local news, workshops, and other resources. Frequently asked questions about the Collaborative Law process. Our attorneys have committed themselves to faithfully observing all of the Principles of Collaborative Law. The choices a divorcing couple make at the beginning of their negotiations may well determine the way their divorce turns out, the kind of relationship they have in the future, and how their children adjust. The fact that they are angry, sad, distrustful, or anxious does not mean that most are not capable of making good choices in how they manage their divorce. In the traditional adversarial system, from the very outset, the parties are labeled and set off against one another as “opposing parties.” The concept of having the parties “opposed” to one another may unduly aggravate the divorce related issues and the inherent conflict. 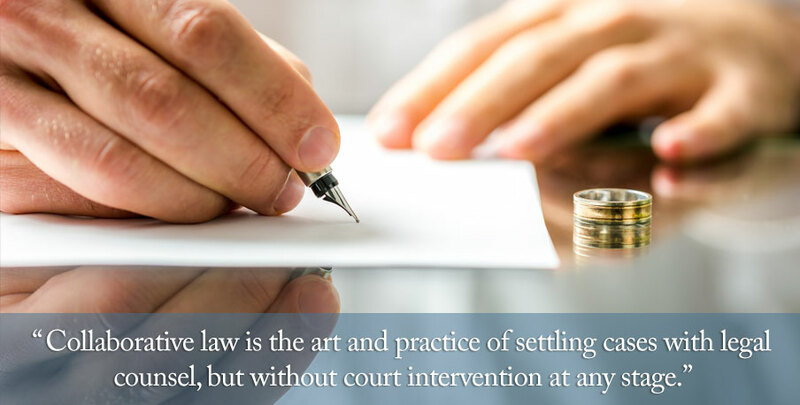 In attempting to resolve the issues between them in this oppositional framework, they may surrender their ability to control the situation and the process and ask the Court to ultimately determine the outcome. The heart of collaborative law is the belief, shared by the parties and their attorneys, that it is in their best interest and in the best interests of their family to resolve differences with minimal conflict and without going to court.